It will give a birdâ€™s eye view of what the condition of the roof was at one time. I do not know when these pictures were taken, but I hope Warren is correct and these large holes have been repaired. Thanks for the details, Warren. avenue on the sidewalk was Painted Quo Vadis is comming. It always struc me as a weird form of advertising. Thanks for posting your memories of the Pitkin, DaveL. I hope to read more from you about your experiences of this remarkable theater. I lived in the Crown Heights section of Brooklyn on Carroll Street near Utiva Avenue in the fifties and sixties and used to go to th Pitkin by bus along East New York Avenue. I remember a Ripleys mens clothing store near the theater and a men’s hat store across the street. Some of the movies I saw there were “Witness for the Prosecution,” “Don’t Give Up The Ship,” “The Last Hurrah.” and “The 7th Voyage of Sinbad.” My parents would take me and I recall getting a bag of plain popcorn for 10 cents, a box of popcorm for 15 cents, or buttered popcorn for 25 cents. The ceiling of stars was great. Atrip to the Pitkin was a treat. Usually my friends and I would go to the Carroll Theater (which interestingly was located on Crown Street not Carroll Street) every Saturday afternoon. If we caused a disturbance the matron, always an older woman in a white dress, would shine that flashlight in our eyes demanding silence. Those were fun times. The Pitkin was still open in November of 1969 without the Loew’s name. Iâ€™m intrigued by the starting times of the De-Luxe Wonder Stage Shows in the ad for â€œApplauseâ€ (evidently in January, 1930; the film opened a two-a-day run at the old Criterion on 7 Oct. â€™29): 1:00, 3:45, 7:00, and 9:00 (with a referred-to morning film at an 11:00 am bargain price). Thatâ€™s highly irregular scheduling which implies some complete shows ran for just two hours, while others promised three and a quarter hours of entertainment. Might the real schedule have been normalized to 1:00, 4:00, 7:00 and 10:00 pm, with the advertisement doing its best to rope in afternoon ladies (for whom a 4:00 start would have suggested too late an exit to preside over family suppers) and evening couples (for whom a 10:00 start would have implied a post-midnight exit with a sleep-deprived next day)? A three-hour complete show seems reasonable in any case for a 90-to-110-minute feature film, forty-minute five-act variety show, and a half-hour or so of newsreel, short subjects, coming attractions, and intermission. 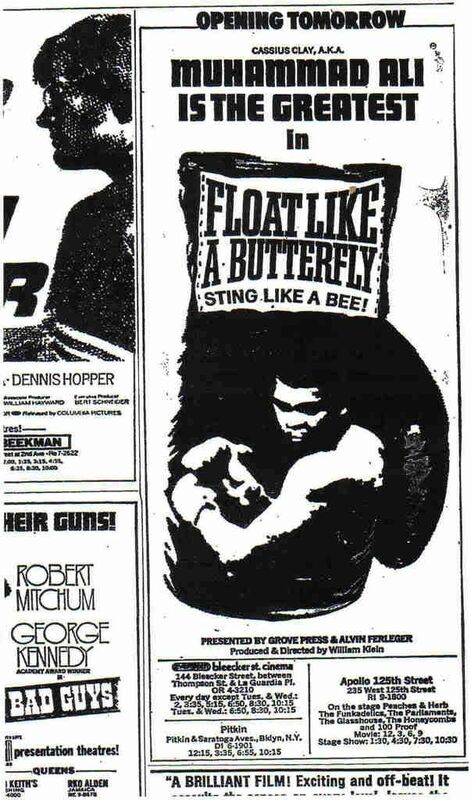 In contemporaneous newspaper ads for the Roxy, Paramount, Capitol, et al. Iâ€™ve seen similarly irregular timetables. The point is moot, since performances were continuous and audiences were socialized to drop in at any time and leave when the loop came â€˜round again. As Joan Crawford used to say, whom was kidding whom? The ad posted about the Pitkin is NOT a Loews paste-up. It was made by the newspaper, and hence it is an error on their part. I’m sure you won’t find the same mistake repeating week after week. Check out Orlando’s comments from March 4th, 2004, way at the top of this page for an early reference to the use of the phrase as a marketing tool by Loew’s. I’ve heard that the term “Wonder Theater” was used with varying degrees of specificity by Loew’s during this period. Interesting, however, that Loew’s would advertise the Pitkin as one of the “big 5 Wonder Theaters”, particularly in that 3rd ad Warren posted that heralds the “new wonder” of the 175th Street which was the last of the Wonders to be built. Did they merely decide to drop reference to the Jersey (already opened the previous year) to target New York audiences? Does anyone out there knows the name of the catering hall that was replaced by I.J. Morris Funural Home. It was situated on Rockaway Pkwy and Church Avenue? Ed, the flea markets (at least when I was last there, were on Sundays only (except certain weekends when they were also Saturday), however, they did indeed take up not only the outer foyer and lobby, but the entire auditorium also. There were vendors in the outer lobby (with the original etched mirrors on the walls yet), the inner lobby, and the auditorium itself. This would be more appropriate to the Kieth’s site, but I just thought I’d add that while the Flea Market may only be in operation on Sunday (I seem to recall it operated in the foyer and lobby space), the theater is open whenever there are Bingo games being run in the former auditorium. I seem to recall walking around the inside of the RKO Keith’s Richmond Hill on or about Saturday July 12 2002. Perhaps now the flea markets are only on Sundays. Ken Roe, it’s been many years since I have been in the Ridgewood Theater, but all of the auditoriums retained ornamentation from what I remember. Vaguely, I remember the side balcony theaters having a lot. In each of those, you have the original walls on one side (outer walls of the original theater, and the ceiling had “half-circles” of ornamental plasterwork, until of course you would hit the “new” wall that divides it up. You also had the original fancy balistrade railings too. I remembered liking to sit in the first row in front of the railing on the sides, which would be about half way up in the what was the balcony. Downstairs ornamentation also survived, but again, you have a “new” wall on one side, and the original on the other. I believe all the theaters were painted a dark blue, with brown railings, floors etc. The original paintjobs and all different colors are long gone. If you come to Queens, and stop in Richmond Hill, you should REALLY try and stop at the RKO Keith’s Richmond Hill, which is now a flea market and bingo hall. Every Sunday the flea market is run, so you can freely enter the building, and look around. I haven’t been there also in many years, but when I was last there, it was a diamond in the rough, the only desecration done to that theater was removal of the seats, and painting the walls plain beige, other than that, just about everything remains inside, right down to the balcony seats and all the old original light fixtures (although flourescent lighting was hung withing the auditorium). Definitely worth a trip, but do it on a Sunday so you can go inside. I have been thinking about going back for years, but just can’t seem to get there on a Sunday. KenRoe, you’re welcome. I heard on the TV news six weeks ago about luxury condos being built in the South Bronx : “SoBro” : the new “cool” area in NYC to live in ! By all means, go see the Trylon while it’s still there. I first saw a film there Saturday November 3rd 1984 and last saw a film there Friday November 11 1994. How do Richmond Hill and Kew Gardens compare with their London counterparts ? The last Jahn’s ice cream parlor is in Richmond Hill, 117-02 Hillside Avenue, corner of Myrtle, eastern end of the Q-55 bus line, next door to RKO Keith’s Richmond Hill, now a flea market and a bingo hall. It, like the Ridgewood, is rich in internal original decoration. How do NYC cinemas compare to London cinemas ? PKoch & Bob…Thanks for your concern. I am well aware of some of these areas (I have been visiting the USA since 1976, usually a couple of times a year) Actually only got robbed once(my bag had a ‘going over’ in a restaurant in Times Square!). I live in London and there are some areas here I wouldn’t think of going to at certain times, in fact, come to think of it I live in one! LOL. I will be careful and aware…as always. As you say though, these areas have theatres and I feel the urge to visit, armed with my Film Daily Yearbook lists, I just hop on and off the Metro and buses. I found South Bronx scary a few years ago, when I was there last year, there was a great improvement and I spent 2 days wandering the streets. In Queens I want to get to the Trylon as I missed it last time I was in the area, also going take a last look at the RKO Flushing, plus there are many more I need to track down. I like to compare Richmond Hill, Kew Gardens etc. with their London counterparts! Lost Memory…and all of you….I have posted some photos I took last June on the Ridgewood Theatre page. I see its now 3 screens in the former balcony and 2 screens in the former stalls. I wonder which would be best to go into to see anything of original decoration? Ken; please be careful when you go exploring. Many (if not all) of these grand surviving palaces are in rough areas. My brother and I were chased out of a Detroit neighborhood when we tried to look at the Grand Riviera, and I was cornered by a gang of thugs beside the RKO Kenmore in Brooklyn – and that happened in 1976! Lost Memory : C/O is “certificate of occupancy” ? KenRoe, you’re most welcome to the compliments ! Welcome to the USA ! Please stay safe. What theaters in Queens will you be exploring ? Have you noticed the place and street names of Richmond Hill, Kew Gardens, Kensington, Mayfair and Curzon, to name a few, common to London, UK and Queens ? Thanks for the complements guys. It is a wonderful building to photograph and I though I would get it at ‘all angles’ before anything happened to it! I’m happy to share with you all. Bob..It was a sunny hot day, and this atmosphere led to a feeling of security as I wandered around. Schoolkids were just leaving class and at a quick glance all would seem to be ok. However, there were gangs congregating on the street corners who were eyeing me up, but I felt fairly confident I would be ok. Especially as my camera is not large (its the size of a credit card) and I was not pointing my lense at them. I just took my pictures, then left the area. Not a place I would go to after dark though. PKoch…no relation to ‘that’ Kenneth Roe, I am British and based in the UK (but come to the States quite often). I’m back in NYC in June 2006 to explore more theatres hidden away in the Bronx and Queens this time! Thanks for those pictures Ken. What’s the neighborhood like these days? BTW, are you Kenneth Roe of the engineering firm of Burns & Roe ? Herbie, are you the fabled and famous “Prince Of Pitkin Avenue” ?